Behind the wheel of Nissan’s best seller. The Nissan Altima is as American as any sedan gets. Built in Canton, Mississippi, this five-passenger, front-wheel drive midsize sedan features a chrome-wrapped grille, long overhangs and generous room inside. But it is built by a Japanese manufacturer, Nissan, a company that has its pulse on what the American car buying consumer wants. I’ve driven multiple Altima models over the past several years and have found a common thread running through each model. That thread represents a value-oriented sedan with a continuously variable transmission (CVT) powered by a capable four-cylinder or a robust V-6 engine. My fleet samples, though, have always been equipped with the smaller four, an engine that is entirely suited for this car. Yes, you could go with the V-6, but for a model with a highway fuel economy rating of 38 mpg and no slack in power, why would you? For 2015, Nissan prices the base model from $22,300. You can also choose the 2.5 S ($22,560), a 2.5 SV ($24,720) or the 2.5 SL ($28,150). Choose the V-6 and a single 3.5 SL edition is offered ($31,950). As tested, I had a 2.5 SL all to myself — it came with a moonroof package ($800), carpeted floor mats and trunk ($210) and a technology package ($1,090). With its destination charge this sedan cost $31,060, or in the pricing neighborhood of competing, well-optioned sedans. Some new car shoppers stay away from the Altima because of its CVT. Sure, go ahead and knock it for it rubber-band effect — the feeling you get when you step on the accelerator and the transmission gradually stretches behind the rpm curve. It is at this point the engine whirs unmercifully, but that same engineering is what enables this model to get its excellent fuel mileage. With Nissan on track to sell 320,000 Altimas this year — far more than any other Nissan model — most shoppers probably won’t care about the CVT. Its not as if there is any midsize front-wheel drive model that provides involved driving anyway. Most manufacturers offer a base model, what serves as the “stripped down” loss-leader edition. 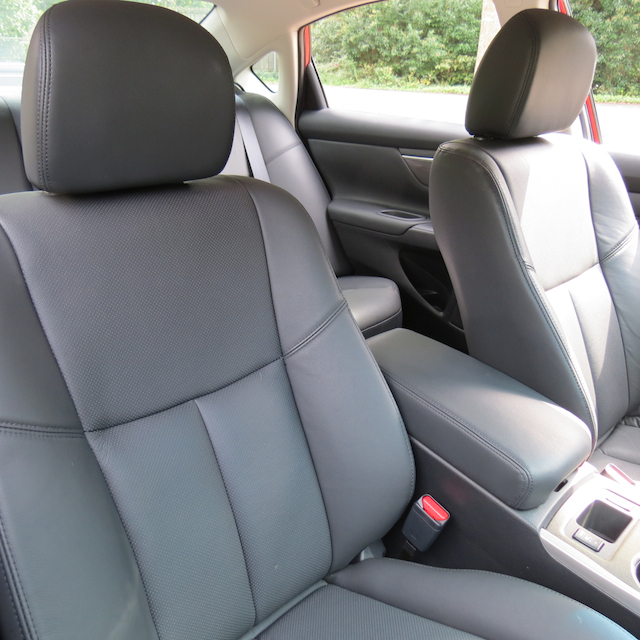 In the Altima the base model serves primarily as a placeholder to greater things. Indeed, for just an additional $260 you can get behind the wheel of an S edition that brings in automatic headlamps, cruise control and keyless entry. That’s on top of Bluetooth connectivity, dual chrome exhaust finishers and vehicle dynamic control offered standard across the model line. If you’re going to look at the Altima, especially when equipped with the four-cylinder engine, the 2.5 SV may offer the best bang for the buck. For the mid-$20,000s price range you get all the features of the S along with 17-inch aluminum alloy wheels, remote engine start, a five-inch color display, NissanConnect infotainment and an eight-way power adjustable driver’s seat. Technology and convenience packages will put your price closer to $28,000, still considerably below the top end of the line. But that wasn’t the model I tested. 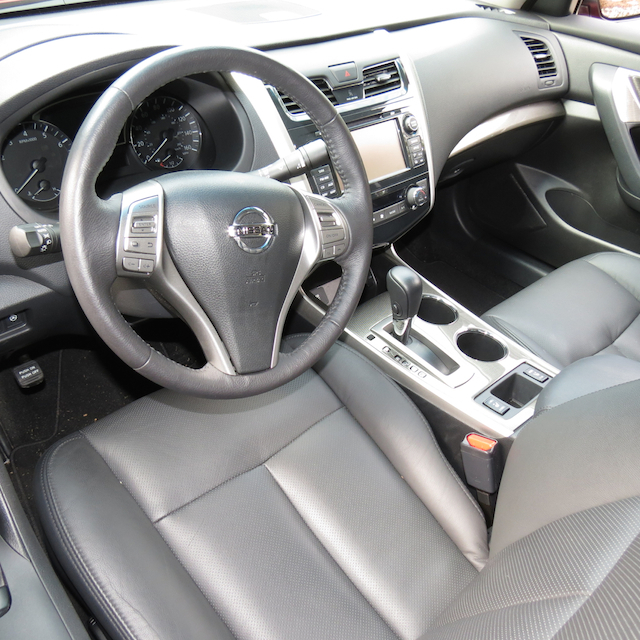 The top-end Nissan Altima 2.5 SL comes with all the bells and whistles you would expect or plan to pay for. That technology package includes what mostly every driver wants today: a navigation system. Nissan adds in a larger 7-inch color display as well as three safety features: blind spot warning, lane departure warning and moving object detection. You also get SiriusXM Traffic and Travel Link. In the SL, Nissan dresses up the exterior too by providing automatic headlights, fog lights, LED tail lights, heated outside mirrors, manually folding side mirrors and chrome exhaust finishers. Inside, the SL comes with push button start, leather seating, a heated leather-wrapped steering wheel, driver’s lumbar support, a 4-way power front passenger seat, a 9-speaker Bose audio system, dual zone climate control, rear air-conditioning vents and power accessories. This model also provides dual illuminated vanity mirrors, an automatic dimming rear mirror, two 12-volt outlets, four bottle holders, four cup holders, front seat back pockets and a cavernous glove box. USB and auxiliary input ports are found in a deep open compartment at the base of the center console — it is so deep that you might forget that you left your smartphone sitting there as I had. I had no complaints about the driver’s seat except for one very small issue: a slightly lower seating position would have been great. Even so, with the tilt and telescoping steering wheel column I was able to find just the right adjustment — you probably will too. The Altima’s instrument panel features a pair of analogy displays — tachometer on the left, speedometer on the right — and a larger digital driver information center in the middle. Easy to use cruise and secondary controls sit right on the steering wheel. Traditional switches and knobs are on the center console. A deep storage compartment with an attached tray divides the front seats. A coin holder and heated seat controls are just fore of that compartment. The rear 60-40 split seat comfortably seats three people. 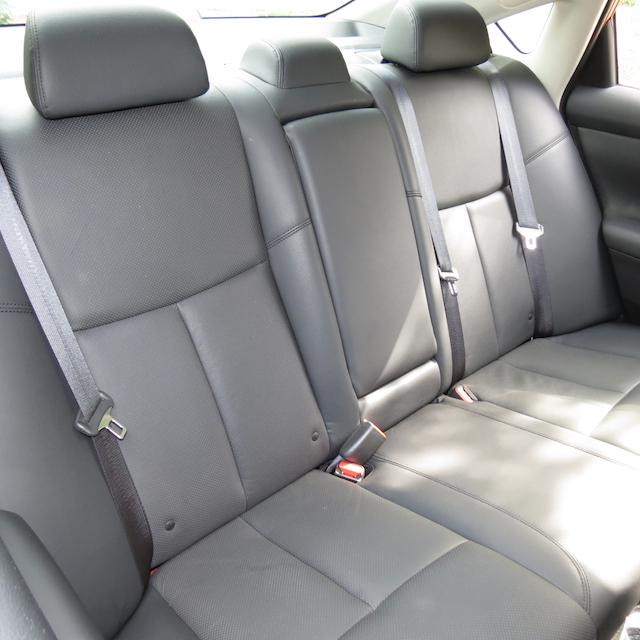 You can also let down the larger portion of the seat to gain access to the trunk. There is a switch behind the seat — between two of the three car seat anchor points — that gets the job done. The switch wasn’t where I expected it to be — they’re usually attached to the seat itself — but it works. The smaller section of the seat, however, does not fold down. As expected, you can pull down the center seat arm rest to gain access to the two rear cup holders. I touched on the Altima’s on-road characteristics earlier. Illuminating that point, the Altima does a good job in the torque steer compartment, using active understeer control to minimize the effect. Otherwise, steering is numb, cornering is good and braking gets the job done by bringing this sedan to a firm, clean stop. 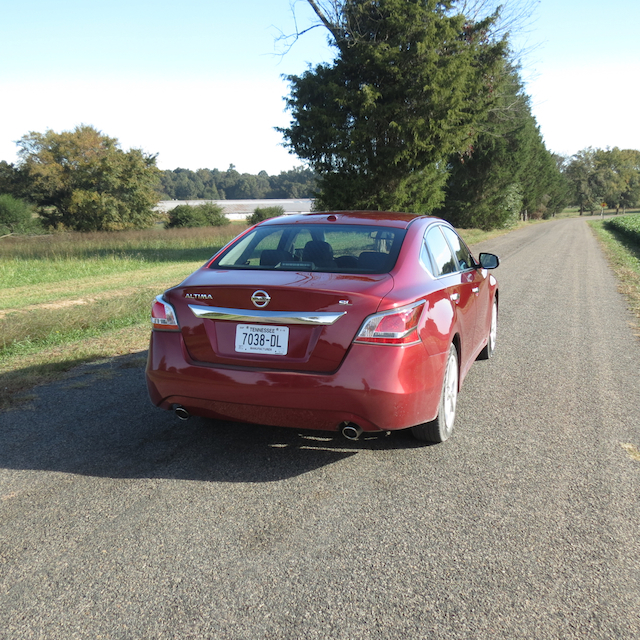 The Altima has a boatload of competition in the segment and I’ve tested nearly every model. You have the Chevrolet Malibu, Ford Fusion, Hyundai Sonata, Chrysler 200, Subaru Legacy, Mazda 6, Honda Accord and the Toyota Camry. The last two outsell the Altima, but Nissan is ahead of the rest. Don’t expect to find a well-optioned sedan for $25,000 in this segment, unless you consider Hyundai and, yes, the Chrysler. Still, most sedans will run from the upper $20,000s to low $30,000s, a price point that is consistent with the average cost of today’s new vehicles. 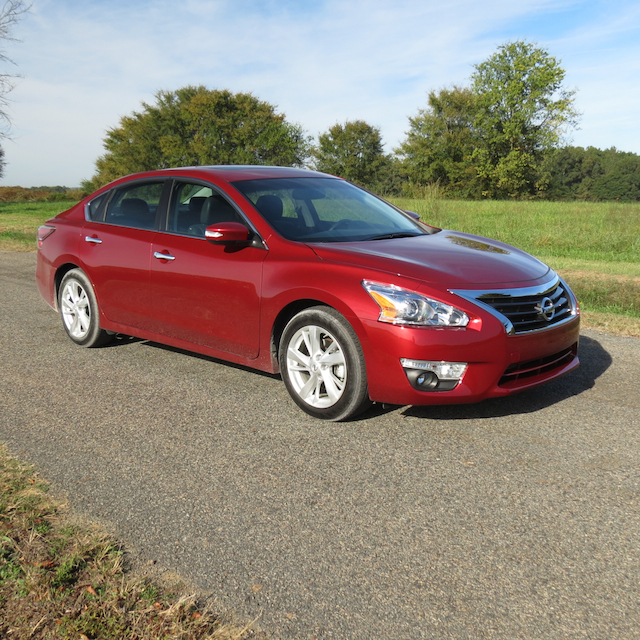 2015 Nissan Altima 2.5 SL photos copyright Auto Trends Magazine. All rights reserved.